If you’re hoping to one day find yourself working as a writer for television, then you need to quickly become familiar with how to write a “spec” script. Spec is short for the speculative script. It technically refers to something you wrote on speculation (sometimes referred to as “wrote on spec”), which really means that you wrote the script for free. You hope that you might later sell it or get hired for a writing job because of it, but to have the chance of either possibility, your only choice was to write the script. After all, much in the same way an artist or photographer has a portfolio, the television writer has a collection of sample scripts that show the Hollywood community that they can, in fact, write for television. Unlike a spec script for movies where your skills can sell a script, a television spec script is meant to sell your skills. A spec script for television is typically one of two things. It’s either an episode of an existing television show or it’s an original piece of work such as a television pilot. Sometimes a movie script or play can be used if it shows a truly unique voice or talent that might not be evident in a typical television script. But usually, it’s either an original pilot or a sample episode of a popular TV series. Are you more passionate about comedy or drama? What type of shows do you enjoy as a viewer? Make a list of your favorite TV shows. Start asking yourself which of those shows would be the most fun to write on. If you’re an or junkie, then becoming a comedy writer is probably not for you. But on the other hand, if you love The Office and popular drama-dies (mix of comedy and drama) like or Ugly Betty then becoming a TV comedy writer might be the career path of choice. Tip: You might be multi-talented and able to write for both comedies and dramas. Eventually, you might have the opportunity to do so. But when you’re first starting out, it’s extremely important that you focus your efforts on one or the other. It comes off as both arrogant and ignorant when a newbie TV writer states they can write in every genre imaginable. Now that you’ve determined whether you are a comedy writer or a drama writer, your next order of business is to decide which show you’re going to write a sample episode of. To do this, take a look at your list of favorite shows. Which of those shows are the most popular? Which ones have the most “buzz” around them? Tip: A “buzzworthy” show might be a television show that might not be exceptionally popular with the viewers or even with the critics, but for whatever reason, draws a lot of attention to it. For example, the comedy ”Two and a Half Men” is quite popular, but The Office is more buzzworthy. For dramas, "Grey’s Anatomy" is extremely popular, but "Dexter" has a lot of buzz around it. Sometimes writing a high-quality episode of a buzzworthy show will get you noticed faster than writing what’s popular. Understand how the show is created from a writer’s perspective. Ideally, you’ll want to not only watch as many episodes as you can, but you’ll also want to track down a few scripts of the show if possible. If you live in Los Angeles, there are a number of local booksellers that offer up episodes of numerous television shows. If you live outside Los Angeles, simply type in the show you’re considering writing into Google with the word, “scripts” and more than likely, you’ll locate someone who (for a modest fee) will send you as many episode scripts as you need. Tip: Be sure NOT to get a “transcript” of a given show. A transcript is nothing more than the dialogue as it’s heard when it plays on television. You want an actual script that includes all dialogue, stage direction, and descriptions. Once you have a number of scripts in hand, begin to track how the show is structured. Is it a two, three or four act structure? Does it have an “A” story (main story) along with a “B” story (another story that’s usually less significant) or maybe even a “runner” or “C” story (a small storyline that unfolds in the background of a given episode)? What are the voices of each character like? What makes them unique? Do they have particular words they say or gestures they make or specific likes and dislikes? Make notes of anything you think might be helpful as you go to write your own sample episode of the show you’ve chosen. You’re now ready to begin the fun (and terrifying) process of writing your spec script. Now, unlike every writing handbook on the planet, I will tell you there is no right way or wrong way to write a script. You have to do whatever works for you. I often recommend to new writers to start with an outline first of the basic elements of the story and then slowly “flesh out” (adding material and dialogue) each scene until it starts to take shape. An outline will help you keep your story on track and point out any holes that might be there before you jump into dialogue. There are a few no-nos that you want to pay attention to when writing a spec script. If you ignore the following pieces of advice, chances are your script won’t make it very far up the ladder. That said, sometimes the phrase, “the only rules are, there are no rules” is perfect for writing a spec. 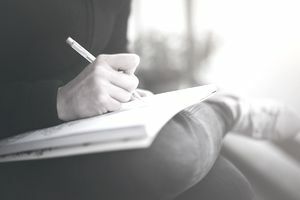 Now that you’ve written your first draft, you need to get some feedback in the form of “notes.” Preferably from people who know how to give notes. Notes refer to a collection of valuable suggestions that will help improve the overall quality of your spec script. Keep in mind; there is a huge difference between notes and opinions. Opinions are things like, “I liked it,” “It was funny,” “It was scary” – and the like. Frankly, opinions are useless. You need more “actionable” notes that will allow you to fix what’s broken. Try to give your script to friends who are either writers or in the industry – or at least have a thorough understanding of the type of constructive criticism that you’re looking for. You want to pass it out to at least 3-4 people. This will give you a wide enough variance of opinions, but you’ll also start to see numerous similarities in the notes that are given. By the way, when you receive the same note from three or four different people, that’s a note to address. A Note on Notes: Getting notes on your script can be a painful experience. But if you can teach yourself to remove any emotional element from what’s being said, you’ll find the experience quite valuable. You need to detach yourself from the script, stay very quiet and listen to what the note-giver is trying to tell you. It doesn’t matter if you think the scene you wrote is brilliant if three of your readers can’t make sense of it, you need to hear what the problems are and figure out how to address them. Take the time to get the feedback your script needs and deserves. Once you have all of your notes in hand, start rewriting. Address the notes you agree with and ignore the ones you don’t. It’s your script after all. A rewrite can take it’s time as well. Give it the time it needs. You will often find as many writers do that the “perfection” you thought existed in the first draft got a lot more perfect as you did a rewrite. Learn to lose what’s not working and never marry yourself to a scene, joke, line or character. If something is weighing down the quality of your script, it will ruin your chances for success. The more you’re willing to change the better your script can become. That said, you might have certain elements that you feel quite strongly about. Assuming your note-givers didn’t all give you the same note to fix it, then you might decide to keep that piece. Just be sure to open yourself to the possibility that a rewrite might dramatically improve what’s already there. You may now want to consider repeating the process. Write a spec script of another show so that you have at least two samples someone can read that shows off your skills as a writer. You won’t exactly double your chances of success, but the extra spec comes in mighty handy if you’re told a certain agent or executive won’t read the show you’ve written (which happens from time to time). Writing a spec script can be a long and arduous process. But if you give it the time and preparation it needs to blossom, chances are you will write a spec script that will do more than enthrall the reader – it’ll get you a professional television writing job! Don't Create New Main Characters: In a spec, you never want to create a new main character for a show. It doesn’t matter how funny or inventive you think the new character is, by inventing a new main character, you change the dynamics of the show and some potential employers will find that arrogant. Keep in mind that I’m referring to the creation of characters that will go beyond the episode you’re writing. You can create as many characters as you need for a single episode. Stay Away from the "Cabin" Show: The “cabin” show refers to those episodes of sit-coms that have the group trapped together in some way – for example, in a mountain cabin in a snowstorm. Whatever show you choose already has well-established dynamics. And since you’re writing a sample episode of the show you’ve chosen to convince others that you can, in fact, write within the pre-established parameters, be sure to do so. Follow the Format: Again, it’s crucial that you follow the pre-existing format of the show. Do not waver from this even slightly, because your creation could quickly become unrecognizable. Stay on Voice: Each character has a unique “voice” in the show, and the show itself has its unique tone. You want to be 100% sure you nail these elements. Rewrite Until It's Ready: Don’t be in a hurry to get your spec out to an agent. You want to be sure it’s ready to be read as chances are, you’ll have one shot and one shot only. So, take the time to get your first draft ready – get good notes and do appropriate rewrites before you show off your work. So, You Want to Become a Screenwriter?